Winter is coming: so it was decided that we’d sample a few specialty beers on tap at the Mc Nellie’s in Norman. We tried Bridgeport’s Witch Hunt, Mustang’s Harvest Lager, Samuel Adams’ Winter Lager and Great Divide’s Hibernation Ale, which is Great Divide Brewing Company’s winter seasonal. And because we are drinking on the company tab, we decided the best bang for our buck was the Hibernation Ale. Great Divide never disappoints when it comes to taste, quality, and alcohol by volume (ABV). 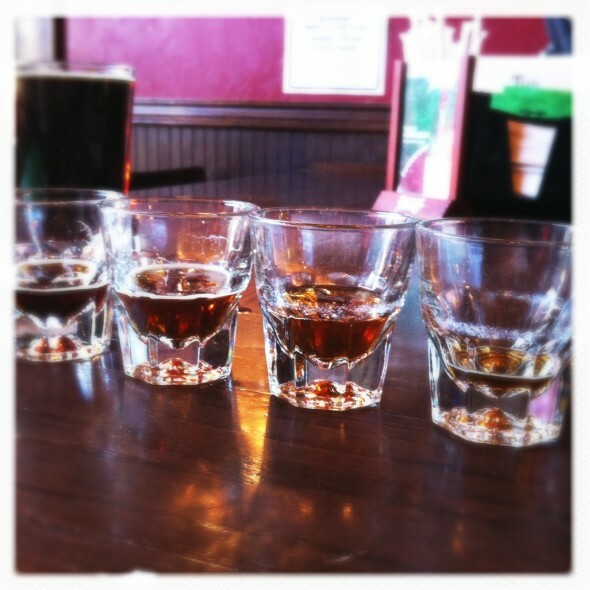 Left to Right: Bridgeport Witch Hunt, Mustang Harvest Larger, Samuel Adams Winter Lager and Great Divide Hibernation Ale. The Great Divide Seasonal Hibernation Ale really stood out among the samples of beer we asked to try. To be fair, it’s not like I had a style in mind when we arrived to do the tasting. My only criteria for this review: it must on tap and it must be a fall or winter beer. To that end, the others beers in the line up were not bad beers, but when I ranked my options by appeal, it was the dark inviting amber color and sweet scent of roasted malts of the Hibernation Ale that won out among the other competitors. It was served to us in pint glasses. I noticed that this ale had a small head that dissipates quickly, it also leaves little to no lacing. Upon first taste, there is a ready sweetness that hits the palate. After the malty brown sugar notes that are a few shades closer to caramel than toffee, I want to say there is a bit of coffee and dark fruit some where in this mix of sweetness, afterwards there’s a distinct hop finish. The hops have a more earthy herbaceous flavor. Honestly, the range of complexity experienced on the malt side of this beer is the best part. Still, it is not overpowering, and this winter ale kind of reminds me of a less hopped up version of COOP’s latest territorial oak-aged barley wine. The Hibernation Ale is slightly cloying, but over all it is nicely balanced. It has great carbonation on tap, making it very enjoyable to sip. Gorgeous. So dark, so balanced, so tasty. 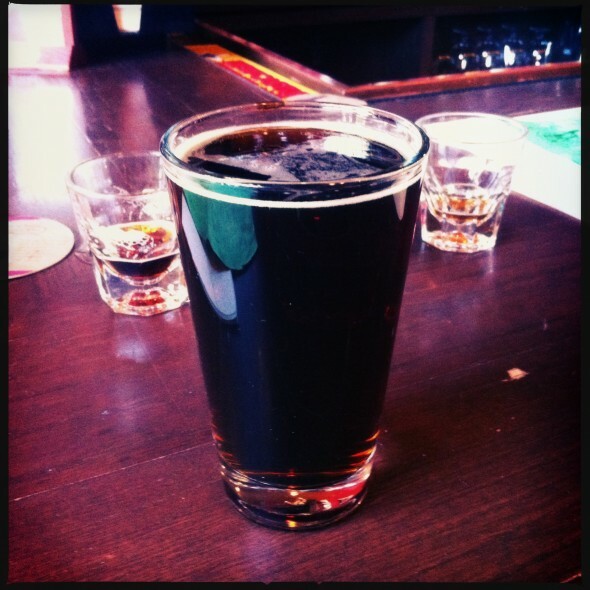 The Hibernation Ale clocks in at 8.7% ABV and costs $7 a glass at McNellie’s. The Hibernation Ale makes a great first impression. The smell is malty, with just a hint of a brown sugar sweetness, and its color is a very attractive dark brown with shades of a ruby when the light hits it (not unlike Guinness). The mouthfeel also reminds me a bit of a stout. It manages to be a thick, meaty beer without having the intimidating coffee bitterness of the darker beer. I love this beer. With a very strong malt profile that is well balanced by hop bitterness, the Hibernation Ale is reminiscent of a barley wine, and a perfect cold-weather beer. Great Divide has yet to make a beer I haven’t enjoyed, and the Hibernation Ale is no different. The price is a bit hefty, but you can’t beat it if you’re looking for a winter seasonal. Don’t have too many, though, because the high alcohol content may make you ready for a long winter’s nap. Tagged beer, Bridgeport Witch Hunt, COOP, cs, Great Divide, Great Divide Brewing Company, Great Divide Brewing Company Seasonal Hibernation Ale, Hibernation Ale, Mustang Harvest Lager, Mustang Harvest Larger, options. Bookmark the permalink.